, an English poet and divine, was the son of a father of both his names, who was fellow of Pembroke college, Oxford, prebendary of Wales, canon, of Bristol, and vicar of St. Mary Magdalen, Taunton, Somersetshire. Refusing to take the oaths after that revolution which placed a new family on the throne, he relinquished *all his preferments, in 1691, and retired to Kentbury in Buckinghamshire, where he died Feb. 10, 1736, aged eighty-five. His son informs us, that when judge Jeffries came to Taunton -assizes in 1685, to execute his commission upon the unfortunate persons concerned in Monmouth’s rebellion, Mr. Harte, then minister of St. Mary Magdalen’s, waited on him in private, and remonstrated much against iiis severities. The judge listened to him calmly, and with some attention, and though he had never seen him before, advanced him in a few months | to a prebendal stall in the cathedral church of Bristol. Old Mr. Harte was so much respected for his piety and learning, that the prelates Kidder, Hooper, and Wynne, who successively filled the see of Bath and Wells, contrived that he should receive the profits of his prebend of Wells as long as he lived; and Mr. Simon Harcourt, afterwards lord chancellor, offered him a bishopric in queen Anne’s time, which he declined with grateful acknowledgments. According to his son’s account, he was a most laborious student, employing ten or twelve hours a day, without any interruption, but that of casual sickness, for fifty years successively. His principal business was in referring every difficult part of Scripture to those particular passages in the fathers and eminent modern divines who had explained them expressly or occasionally. The time of our poet’s birth has not been settled. A writer in the Gentleman’s Magazine fixes it about 1707, but an earlier date will correspond better with circumstances. If he was born in 1707, his lines to lady Hertford must have been written at eleven, which is highly improbable, yet there is some difficulty in adjusting the date of this poem. 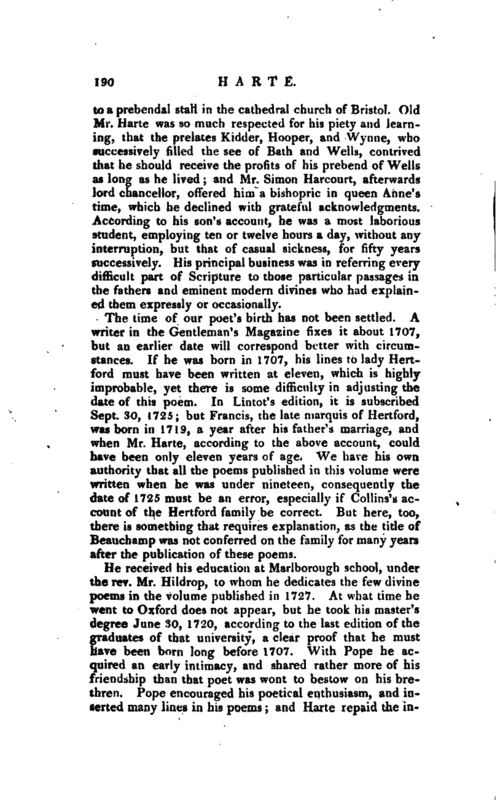 In Lintot’s edition, it is subscribed Sept. 30, 1725; but Francis, the late marquis of Hertford, was born in 1719, a year after his father’s marriage, and when Mr. Harte, according to the above account, could have been only eleven years of age. We have his own authority that all the poems published in this volume were written when he was under nineteen, consequently the date of 1725 must be an error, especially if Collins’s account of the Hertford family be correct But here, too, there is something that requires explanation, as the title of Beauchamp was not conferred on the family for many years after the publication of these poems. He received his education at Marlborough school, under the rev. Mr. Hildrop, to whom he dedicates the few divine poems in the volume published in 1727. At what time he went to Oxford does not appear, but he took his master’s degree June 30, 1720, according to the last edition of the graduates of that university, a clear proof that he must have been born long before 1707. With Pope he acquired an early intimacy, and shared rather more of his friendship than that poet was wont to bestow on his brethren. Pope encouraged his poetical enthusiasm, and inserted many lines in his poems; and Harte repaid the | instructions of so distinguished a preceptor, by compliments introduced, not without elegance and propriety, in his Essays on Painting and on Satire, and elsewhere. In 1727, he published the volume of poems, already mentioned, dedicated to the gallant and eccentric earl of Peterborough, who was, as the, author acknowledges, the first “who took notice of him.” This volume was ushered in by a very numerous list of subscribers, among whom is the name of Alexander Pope, for four copies. An edition of these poems may be sometimes picked up, dated 1739, and printed for John Cecil, instead of Bernard Lintot, the original publisher. As the same list of subscribers is repeated, it is probable that these were the remaining copies bought at Lintot’s sale (who died in 1737), and published with a new title-page. In 1730 he published his “Essay on Satire,” 8vo, and in 1735 the “Essay on Reason,” folio, to which Pope contributed very considerably, although no part of his share can be exactly ascertained, except the first two lines. He afterwards published two sermons, the one entitled “The Union and Harmony of Reason, Morality, and Revealed Religion,” preached at St. Mary’s, Oxford, February 27, 1736-7, which excited so much admiration, or curiosity, as to pass through five editions. The other was a “Fastsermon,” preached at the same place, Jan. 9, 1739-40. He was afterwards vice-principal of St. Mary-hall, and in so much reputation as a tutor, that lord Lyttelton, who was one of his earliest friends, recommended him to the earl of Chesterfield, as a private and travelling preceptor to his natural son. With this young man, to whom his lordship addressed those letters which have so much injured his reputation, Mr. Harte travelled from 1746 to 1750. Lord Chesterfield is said to have procured for him a canonry of Windsor, in 1751, “with much difficulty,” arising from his college connections, St. Mary-hall, of which Dr. King was principal, being at that time noted for jacobitism. 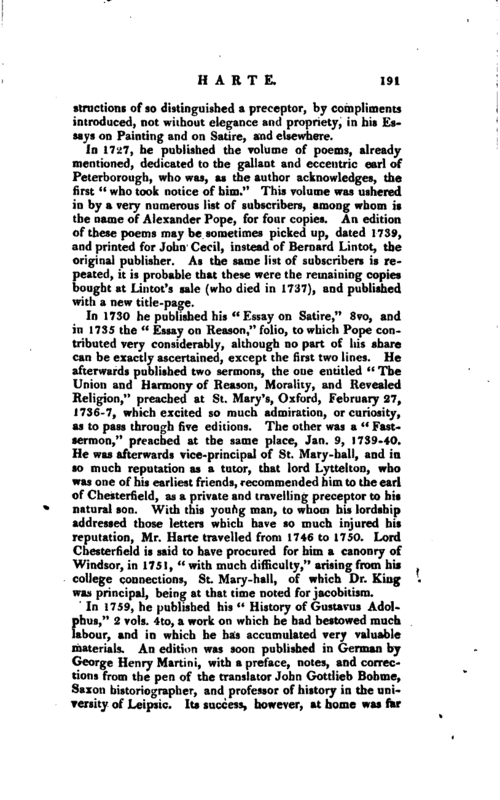 In 1759, he published his “History of Gustavus Adolphus,” 2 vols. 4to, a work on which he had bestowed much labour, and in which he has accumulated very valuable materials. An edition was soon published in German by George Henry Martini, with a preface, notes, and corrections from the pen of the translator John Gottlieb Bohme, Saxon historiographer, and professor of history in the university of Leipsic. Its success, however, at home was far | inferior to his hopes, although sufficient to encourage him to publish an 8vo edition in 1763, corrected and improved. At this time he resided at Bath, dejected and dispirited between real and imaginary distempers. In November 1766, a paralytic stroke deprived him of the use of his right leg, affected his speech, and in some degree his bead. He employed, however, his intervals of health, in preparing “The Amaranth” for the press, which was published in 1767. 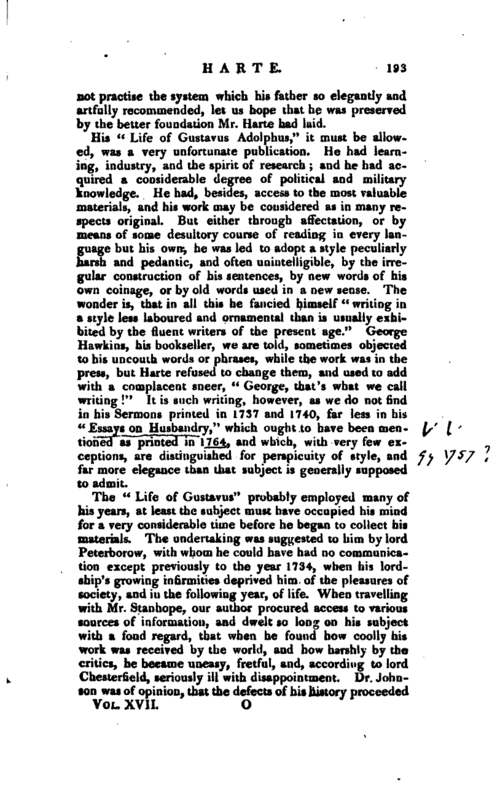 In the following year, he had entirely lost the use of his left side, and languished in this melancholy condition till March 1774, when he breathed his last, having just outlived the publication of the celebrated letters addressed to his pupil, Mr. Stanhope, but which, it is hoped, he did not see. At the time of his death he was vicar of St. Austel and St. Blazy in Cornwall. All this, however, lord Chesterfield knew, and yet appointed Mr. Harte, appears to have been perfectly satis-, fied with his conduct, and treated him with great kindness and condescending familiarity as long as he lived. 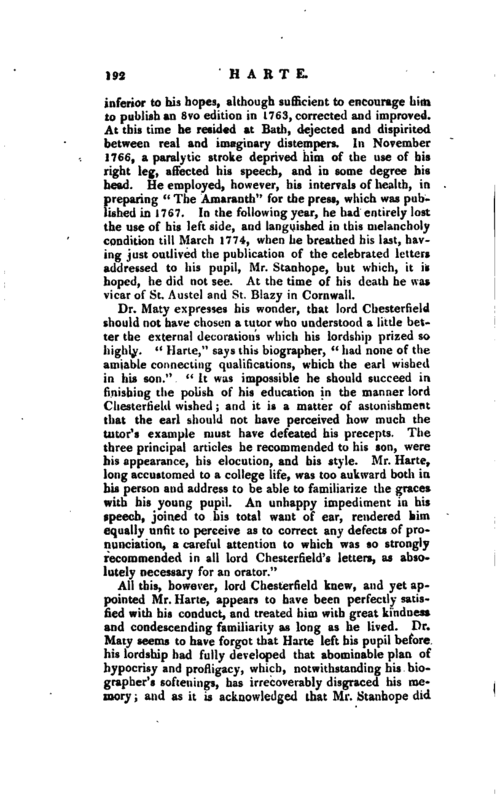 Dr. Maty seems to have forgot that Harte left his pupil before his lordship had-fully developed that abominable plan of hypocrisy and profligacy, which, notwithstanding his biographer’s softenings, has irrecoverably disgraced his memory; and as it is acknowledged that Mr. Stanhope did | not practise the system which his father so elegantly and artfully recommended, let us hope that he was preserved by the better foundation Mr. Harte had laid. His “Life of Gustavus Adolphus,” it must be allowed, was a very unfortunate publication. He had learning, industry, and the spirit of research; and he had acquired a considerable degree of political and military knowledge. He had, besides, access to the most valuable materials, and his work may be considered as in many respects original. But either through affectation, or by means of oaie desultory course of reading in every language but his own, he was led to adopt a style peculiarly harsh and pedantic, and often unintelligible, by the irregular construction of his sentences, by new words of his own coinage, or by old words used in a new sense. The wonder is, that in all this he fancied himself “writing in a style less laboured and ornamental than is usually exhibited by the fluent writers of the present age.” George Hawkins, his bookseller, we are told, sometimes objected to his uncouth words or phrases, while the work was in the press, but Harte refused to change them, and used to add with a complacent sneer, “George, that’s what we call writing” It is such writing, however, as we do not find in liis Sermons printed in 1737 and 1740, far less in his “Essays on Husbandry,” which ought to have been mentioned as printed in 1764, and which, with very few exceptions, are distinguished for perspicuity of style, and far more elegance than that subject is generally supposed to admit. The “Life of Gustavus” probably employed many of his years, at least the subject must have occupied his mind for a very considerable time before he began to collect his materials. The undertaking was suggested to him by lord Peterborow, with whom he could have had no communication except previously to the year 1734, when his lordship’s growing infirmities deprived him of the pleasures of society, and in the following year, of life, When travelling with Mr. Stanhope, our author procured access to various sources of information, and dwelt so long on his subject with a fond regard, that when he found how coolly his work was received by the world, and how harshly by the critics, he became uneasy, fretful, and, according to lord Chesterfield, seriously ill with disappointment. Dr. Johnson was of opinion, that the defects of his history proceeded | not from imbecility, but from foppery; and it is certain that the critics* while they pointed out the defects in his style, paid due encomiums on the merit of the history in other respects. 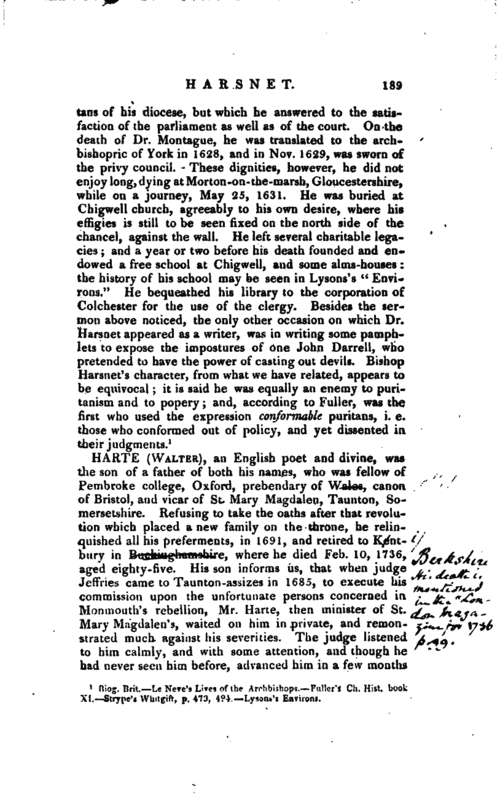 According to Boswell, Dr. Johnson said “he was excessively vain. He put copies of his book in manuscript into the hands of lord Chesterfield and lord Granville, that they might revise it. Now how absurd was it to suppose that two such noblemen would revise so big a manuscript. Poor man! he left London the day of the publication of his book, that he might be out of the way of the great praise he was to receive; and he was ashamed to return, when he, found how ill his book had succeeded. 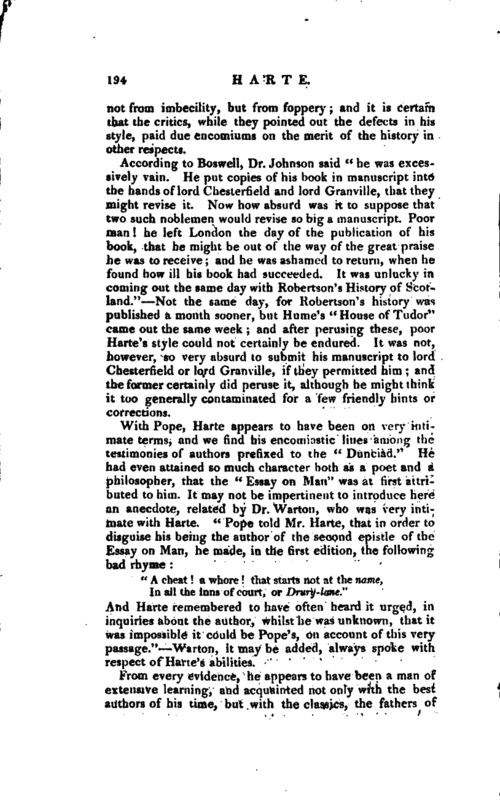 Itwas unlucky in coming out the same day with Robertson’s History of Scotland.” Not the same day, for Robertson’s history was published a month sooner, but Hume’s “House of Tudor” came out the same week; and after perusing these, poor Harte’s style could not certainly be endured. It was not, however, so very absurd to submit his manuscript to lord Chesterfield or lord Granville, if they permitted him; and the former certainly did peruse it, although he might think it too generally contaminated for a few friendly hints or corrections. In all the inns of court, or Drury-lane." And Harte remembered to have often heard it urged, in inquiries about the author, whilst he was unknown, that it was impossible it could be Pope’s, on account of this very passage." Warton, it may be added, always spoke with respect of Harte’s abilities. Notwithstanding the unfortunate reception of his history, he projected another undertaking of the same kind. This we learn from the concluding passage of his Gustavus, in which he says his intention was to carry the history of Germany down to the peace of Munster, but that he was deterred by the magnitude of the undertaking. He adds, however, in a note, that he had completed the history of the thirty years’ war, from the breaking out of the troubles in Bohemia in 1618, to the death of Gustavus in 1632. These papers, with whatever else he left, are supposed to have fallen into the hands of his servant Edward Dore, who afterwards kept an inn at Bath. Dore and his family are no more, and the manuscripts are probably irrecoverably lost. We have his own authority also, that he intended to have written a criticism on the poetry of Dryden, which he seems to have appreciated with just taste. 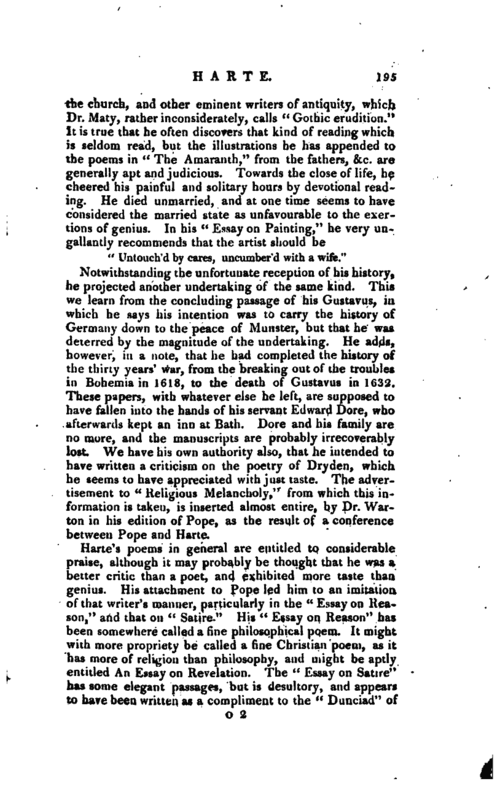 The advertisement to “Religious Melancholy,” from which this information is taken, is inserted almost entire, by Dr. Warton in his edition of Pope, as the result of a conference between Pope and Harte. Harte’s poems, in general are entitled to considerable praise, although it may probably be thought that he was a better critic than a poet, and exhibited more taste than genius. His attachment to Pope led him to an imitation of that writer’s manner, particularly in the “Essay on Rear son,” and that on “Satire.” His “Essay on Reason” has been somewhere called a fine philosophical poem. It might with more propriety be called a fine Christian poem, as it has more of religion than philosophy, and might be aptly entitled An Essay on Revelation. The “Essay on Satire” has some elegant passages, but is desultory, and appears to have been written as a compliment to the “Dunciad” of | Pope, whose opinions he followed as far as they respected the merits of the dunces whom Pope libelled. For his “Essay on Painting,” he pleads that it was written at intervals, upon such remarks as casually occurred itv his reading, and is therefore deficient in connection. He adds that he had finished the whole before he saw Du Fresnoy, which may readily be believed. He discovers, however, a very correct notion of an art which was not at that time much studied in this country, and has laid down many precepts which, if insufficient to form a good painter, will at least prevent the student from falling into gross improprieties. So much knowledge of the art, and acquaintance with the works of the most eminent painters, argues a, taste surprizing at his early age. He had some turn for drawing, and made several sketches when abroad, which were afterwards engraved as head pieces for the poems in the “Amaranth.” In this essay, he delights in images which, although in general pleasing and just, are perhaps too frequently, and as it were periodically, introduced. With all his admiration of Pope, he was not less attached to Dryden as a model; and if he has less harmony than Pope, has at the same time less monotony. Gent Mag. see Index. Chesterfield’s Letters and Miscellanies Bowles’s edition of Pope. Johnson and Chalmers’s English Poets, 1810, 21 vols.